Richard Nichols' production is a class act from a company that has earned its spurs over the years. Carl Davies' courtroom set is all solid wood and brass over which nine light globes hang. The contesting lawyers- Keiron Self's Sir Edward Clark and Robert Bowman's Carson- pace a carpet of red. Peter Knight's use of music is economically apt. Francois Pandolfo, in one of several roles, ascends a set of stairs to preside from on high in judgement. This is the twilight of the Victorian century in defence of its sense of propriety and social and moral order. The two historic trials of Oscar Wilde inadvertently fit a classic dramatic schema. The personality too of Wilde follows a dramatic arc of fall through hubris. 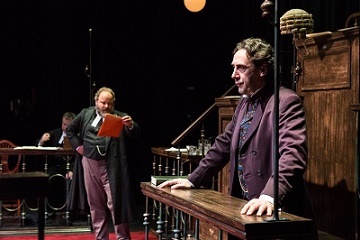 The second act comprises the prosecution against Wilde in which Francois Pandolfo plays a series of damning witnesses, male and female. The first act has the greater crackle of dialectic to it. Wilde is the prosecutor against the Marquis of Queensbury. Steven Elliott in the witness stand creates a Wilde who combines flamboyance of the age of aestheticism with intellectual firepower, sustained by conviction that celebrity makes him invulnerable. The script early on reveals the astonishing level of Wilde's academic achievements in both Ireland and England. The heart of the production is this dialectical encounter between artist and barrister in the libel trial. The lawyer strains to convert the figurative language of verse and prose to literal meaning. Wilde dances away from the interrogation with the assertion that art has no correspondence to the materials of life as it is lived out. He resists Carson's push towards making plain his notion of adoration. He ripostes that the only true object of adoration is himself. He riddles his testimony with aphorism as if the jury is just one more besotted audience. “The truth is rarely pure and never simple”. It may be right as philosophy but it is anathema in a place of law. The play touches on territory that is similar to Nina Raine in “Consent”, the latest production from Out of Joint. The aesthetic argument that Wilde puts forward is as potent in 2017 as in 1895. Works of art do not put forward views, he states. They do of course in terms of views that are literal, the images that ring, but not in the sense of views figuratively as opinion. Over the course of the trials Steven Elliot takes Wilde from brilliant aphoristic fláneur to a figure of stoic serenity. His last speech is to be treasured. That Wilde is a key figure of modernity is revealed in his use of the word “self-realisation.” A later staple of Maslowian psychology it would have been not just conceptually alien to his attackers but also deeply threatening in its implication. Its invention as a concept was not far behind, F H Bradley in 1876 being its first recorded user. Verbatim theatre is over-valued in the theatre of public subsidy. The notion that it has an automatic authenticity over the grind and craft of a dramatist at work is a fad. But funding bodies, gentle herbivores, are easily led. The peaks of the genre have been in judicial enquiry, “Deep Cut” here, “the Permanent Way” and Richard Norton-Taylor in London. “The Trials of Oscar Wilde” part-fits this tradition in a surprising way. Hand-written transcripts of the trial were given to co-author Mervyn Holland as late as 2000. The adaptation for dramatisation by Holland and collaborator John O'Connor is skilfully done. It opens with the playwright basking in the adulation of the public. Voice-overs by Lynne Seymour and Gwawr Loader juxtapose lines from the plays that correspond to the court action. “The Trials of Oscar Wilde” is produced in association with Stonewall Cymru. In London “Angels in America” is being reprised, also in commemoration of the fiftieth anniversary of the passing the Sexual Offences Act. In the media coverage the role of Wales has not been emphasised. But the bill, which received Royal Assent July 27th 1967, was introduced by Leo Abse, MP for Pontypool, at a time when Roy Jenkins was Home Secretary. Mappa Mundi. “A map of the world that does not include Utopia is not worth even glancing at, for it leaves out the one country at which Humanity is always landing.” The author? Oscar Wilde. “The Trials of Oscar Wilde” tours until May 27th visiting Swansea, Brecon, Cardiff,Bangor, Milford Haven, Abergavenny, Llanelli, Porthcawl and Newbridge.